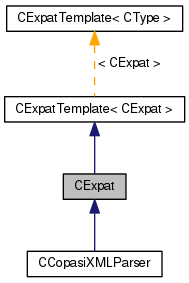 CExpat class. 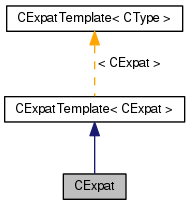 The class CExpat is an instantiation of the CExpatTemplate class above. Is can be used where late binding is preferred to template behaviour. Definition at line 979 of file CExpat.h. Definition at line 31 of file CExpat.cpp. Definition at line 34 of file CExpat.cpp. Definition at line 44 of file CExpat.cpp. Definition at line 52 of file CExpat.cpp. Definition at line 61 of file CExpat.cpp. Definition at line 58 of file CExpat.cpp. Definition at line 97 of file CExpat.cpp. Definition at line 41 of file CExpat.cpp. Definition at line 83 of file CExpat.cpp. Definition at line 65 of file CExpat.cpp. Definition at line 48 of file CExpat.cpp. Definition at line 71 of file CExpat.cpp. Definition at line 55 of file CExpat.cpp. Definition at line 91 of file CExpat.cpp. Definition at line 37 of file CExpat.cpp. Definition at line 79 of file CExpat.cpp. Definition at line 75 of file CExpat.cpp. Definition at line 86 of file CExpat.cpp.